Wellington has a real talent for drawing kids into activities that also have a fun end-product. In this re-issued classic, kids learn all about cookies and where they come from. The lively illustrations make the process that much more fun. Simple, bright pictures contain many, many details to spot and remember. 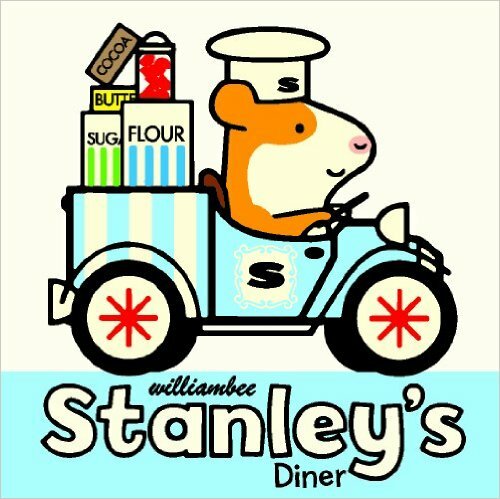 Behind a sign that tells the reader the bakery opens at 9 am, Mr. Baker is hard at work using his flour, sugar, butter, milk, eggs, and salt. 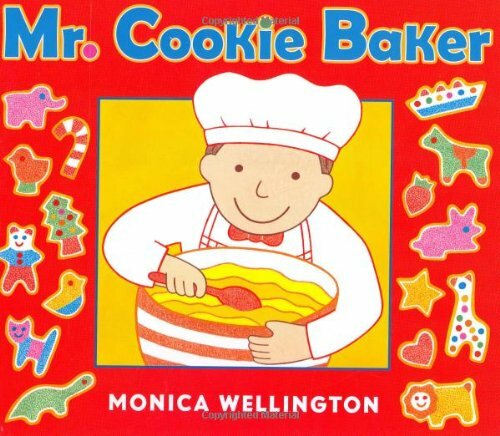 With his big bowl and spoon, measuring spoons and cups, mixer, and spatulas, he mixes his dough. He rolls, cuts, and shapes. He bakes the cookies in a bog oven. They smell delicious. With care, he decorates the cookies. A crowd of customers buy the fresh product. He hangs the closed sign and has a cookie himself. From this, and books like it, kids will learn about the processes that affect the world around them. Most will delight in helping adults try the recipes in the book, decorating the cookies, and giving them the taste test. The presented are: sugar cookies, chocolate chip, peanut butter, and oatmeal. October is the best time of the year for apples, and the farmer in this cute new book seems to know it. Annie has a large orchard with many apple varieties. She picks them, then sorts and organizes them. During the organization phase, the illustrator includes a quick counting motif. Annie makes sweet apple cider, smooth applesauce, muffins, cakes, and pies. For each project, all the equipment used is shown in amazing detail, given the simple design used for the illustrations. After all the preparation, Annie loads up the uncooked apples and many of the cooked projects. She heads to market in the city with them. She has a busy day. 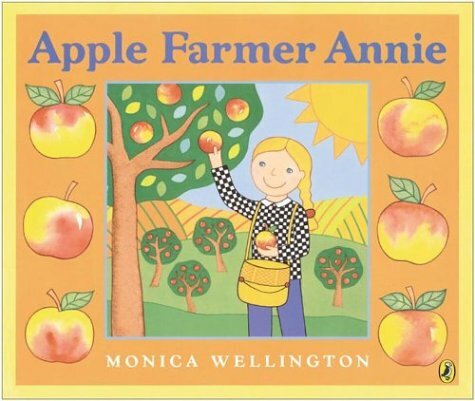 The author lists several apple varieties and even gets in a joke with a book about The Big Apple. The simple language and illustrations make this easily an independent reading possibility, but, as a read aloud, all the many details in the illustrations can be discussed. Of course, the recipes will require adult participation anyway. This opens the door for many more reading activities. What is Stanley up to now? Cooking for hungry customers and teaching youngsters about food and food preparation. 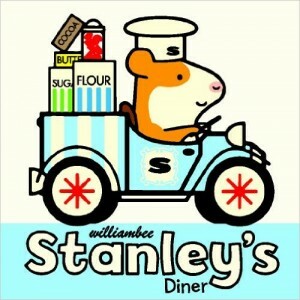 Hattie writes the menu on the blackboard and takes the orders, while Stanley cooks meals in the well-stocked kitchen. Charlie, the customer enjoys putting lots of syrup on his pancakes. Later, Stanley goes to the store and makes a special cake for Little Woo’s birthday. Then he cleans up and goes home. For the very young, this would be a great read aloud for discussion of components and the pictures. Kids can even count the number of slices of toast Stanley’s toaster makes (eight). And they can read the names on the ingredients, such as flour, sugar, and butter. First graders can practice the literacy skills they’re already gaining by spotting the many simple elements in the fun illustrations. Who knows what Stanley will come up with next.